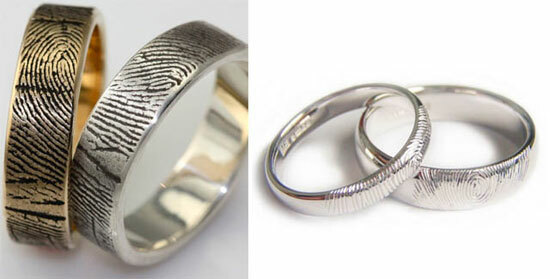 Above: Japanese artist and engraver Sakurako Shimizu makes truly unique engraved rings as part of his "Waveform Series": the "I do" wedding vows are laser-cut and rendered in silver, or gold as wearable jewelry. 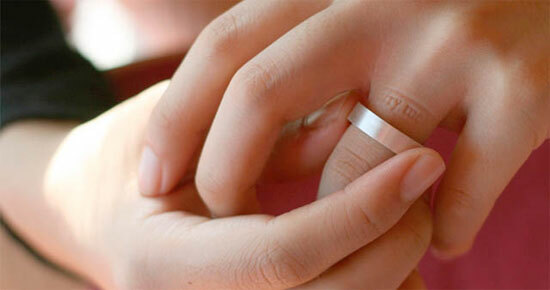 Order your ring custom-made here. Above: You can also enjoy a giggle of your loved one as a bracelet or a necklace - and even the sound of their yawn! 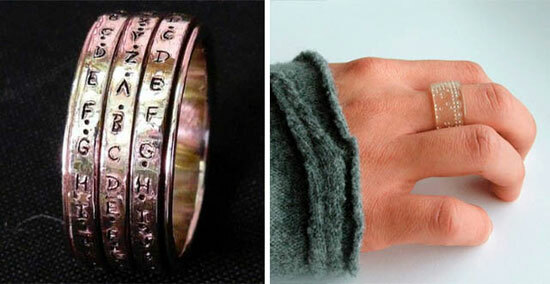 Above: Talking about truly cryptic message: make sure that your loved one knows what you put on a ring, don't leave them guessing... Aptly-named Complexification will inscribe your geeky love message on a ring in a binary machine code. Above: Designed by Isabel Rucker, daughter of well-known science fiction writer Rudy Rucker, this is the ultimate in encryption and perhaps, in marital geek enjoyment: steampunk styled three rotating ring message which will be kept secret as long as nobody cracks the code - more info. 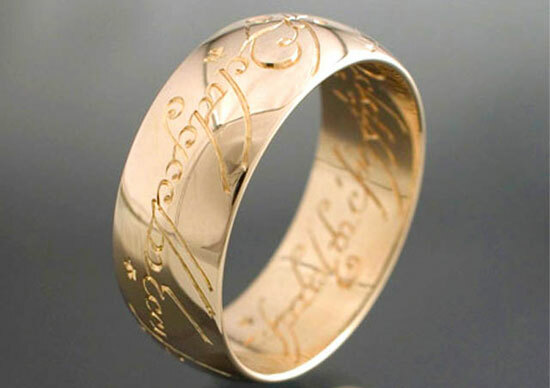 Above: It is pretty tempting to own a perfect "replica" of the Hobbit's ring, and some companies would try to do the best job of engraving the magical language - with or without the name of the ring owner. You can use it for your wedding as long as you write your own love message in Tolkien's alphabet... or ask someone who knows the original language of Mordor. Above: One of the most profound and deep messages (without even mentioning love and wedding vows) is the inscription above. It is mysterious and full of wonder, and we leave it at that. 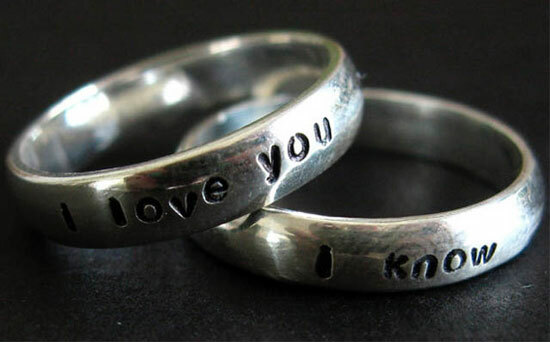 Above: "5% more" is found engraved on the rings of this couple... the explanation is really simple: "When I say "I love you" He always replies with, "I love you 5% more". Above: Very practical suggestion indeed, and a subtle reminder not to lose or misplace it. Another variation: "If removed, alarm will sound." 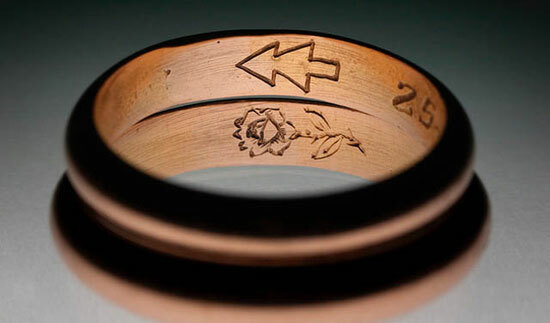 Would be nice if the engraving would change to "Put me back on!" 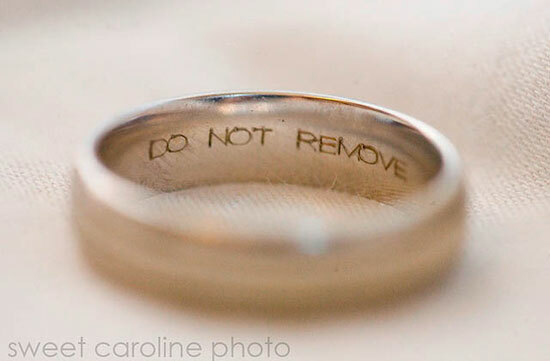 if the ring senses that it's been taken off the finger. Above: The owner of this ring, Pedro Moura Pinheiro, explains: "My wife's family name is Rosa, or "Rose" in English, and mine is Pinheiro, "Pine tree". When we got married, almost nine years ago, we asked at the jeweler's store for an engraving on our wedding rings of the images of our family names instead of the common practice of writing your first names." ... and a pretty mysterious one "MANY ARE THE STARRS I SEE..." which makes it easier to understand by reading the other side: "...YET IN MY EYE NO STARR LIKE THEE". Above: Going on a life journey together, symbolized by this romantic ride in a canoe... or simply engraving your happy faces on a ring as a token of much happiness ahead. Above: We've seen many rings of this variety... a clear favorite with hipsters, geek types or just couples wanting to add the ultimate personification to the old tradition. 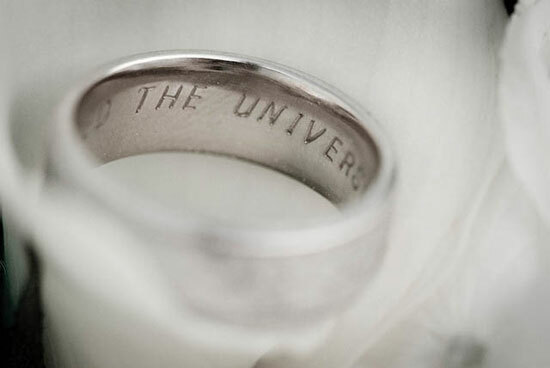 Once you claim this ring and imprint it, it is completely yours and yours only. 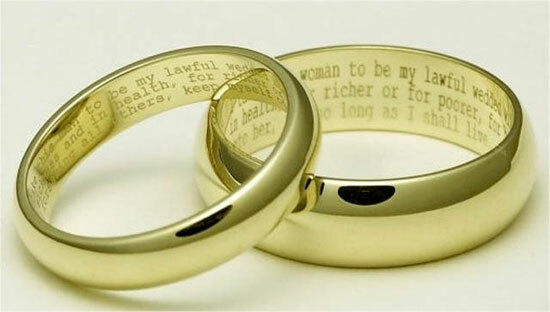 Above: Taking the engraving a little bit further: this was designed perhaps for the jealous kinds, who are anxious for their spouse to always show the marriage symbol (the imprint will stay even if he / she takes the ring off). Above:Even more interesting: the whole message can be imprinted on your skin. This is the "Inner Message Series" by Korean designer Yoon Jung Yun. Above: "24 hours before your special day, the Hot Spot on the interior surface of your Remember Ring will warm to 120 degrees Fahrenheit for approximately 10 seconds, and continue to warm up every hour, on the hour, all day long!" Order these wonders of ring technology here. One woman got a surprise of her life when she spotted something shiny and gold in her toilet. Not just a wedding ring, but one embellished with a string of diamonds and a nice engraved phrase "Christina and Jerry forever." She really has no clue how it got there, as she knows no possible Christian and Jerry couple, the plumber also could not shed any light on this mystery. In any case, if you ever happen to drop your ring in the toilet, here are instructions how to retrive it. 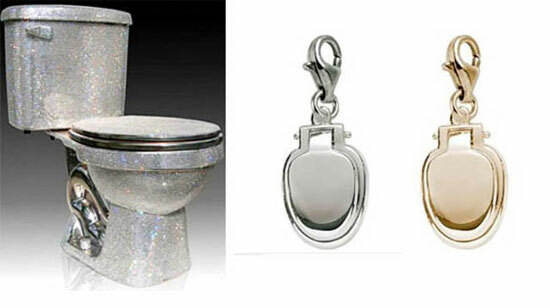 Above Here are some equally strange Swarowski crystals encrusted toilet, via, and Rembrandt Charms made in the shape of a toilet seat. Article written by Avi Abrams, of Dark Roasted Blend - a popular website, covering all sorts of weird and wonderful things.